I've heard about how easy it is to control stuff with a parallel port, but recently I've been asked to write a simple script to send repeated signals to some hardware via lpt and I really needed some way to test whether signals are coming through or not. Googling around a bit, I've found that it's trivial to plug leds right into the port and did just that to test the script. Since it's trivial to control these leds and they provide quite a simple way for a visual notification for an otherwise headless servers, I've put together another script to monitor system resources usage and indicate extra-high load with various blinking rates. Probably the coolest thing is that parallel port on mini-ITX motherboards comes in a standard "male" pin group like usb or audio with "ground" pins exactly opposite of "data" pins, so it's easy to take a few leds (power, ide, and they usually come in different colors!) from an old computer case and plug these directly into the board. 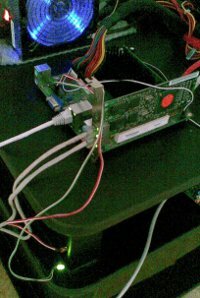 Parallel port interaction is implemented in fairly simple pyparallel module. Making leds blink actually involves an active switching of data bits on the port in an infinite loop, so I've forked one subprocess to do that while another one checks/processes the data and feeds led blinking intervals' updates to the first one via pipe. System load data is easy to acquire from "/proc/loadavg" for cpu and as "%util" percentage from "sar -d" reports. And the easiest way to glue several subprocesses and a timer together into an eventloop is twisted, so the script is basically 150 lines sar output processing, checks and blinking rate settings. Obligatory link to the source. Deps are python-2.7, twisted and pyparallel. Guess mail notifications could've been just as useful, but quickly-blinking leds are more spectacular and kinda way to utilize legacy hardware capabilities that these motherboards still have.